None other than old Jalopnik friend Stephen Colbert showed up for the North American debut of the Audi A7. Apparently, Audi is sponsoring his boat in a race from Charleston to Bermuda. Awesome cameo is awesome. Colbert has been waging a publicity battle with quasi-nemesis Richard Branson to race against him in May. Audi will sponsor his boat — now called "The Audi" — featuring a sail emblazoned with the Audi rings and, if the auto show stage display is correct, a picture of Colbert's head, while the television host serves as "Morale Officer." "As I understand it, my yacht will be the first equipped with Quattro all-wheel-drive." "We will be the first yacht to sail the Atlantic while listening to 'Rock You Like A Hurricane' by the Scorpions, unless we run into an actual hurricane, in which case we will drown to the sounds of Celine Dion's 'My Heart Will Go On.'" 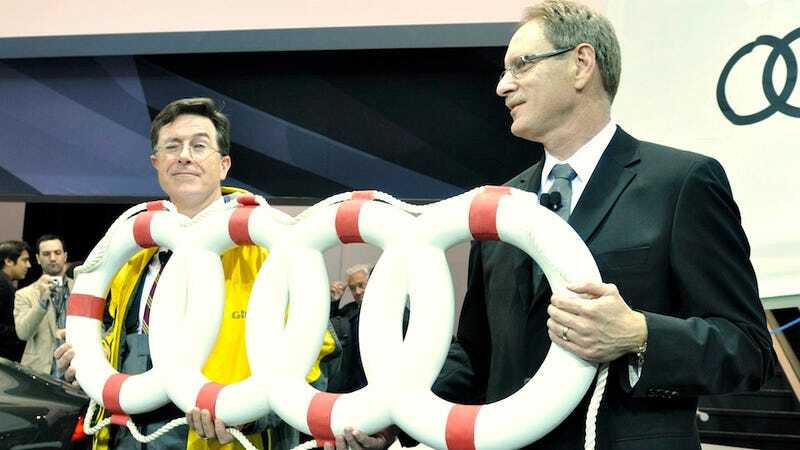 Audi of America president Johan de Nysschen also presented Colbert with a Audi-specific life preserver, continuing Audi's habit of gifts for famous people.